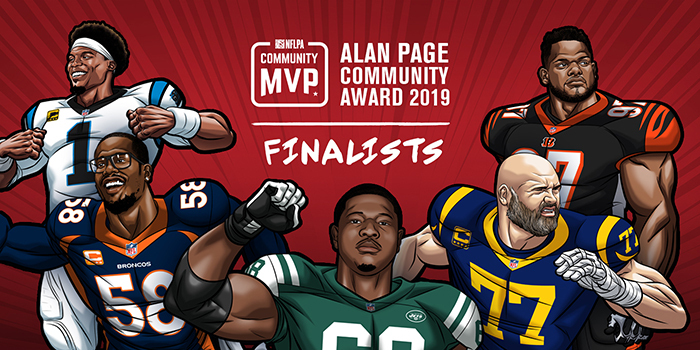 WASHINGTON, D.C. – The NFL Players Association is proud to announce the five finalists for the 2019 NFLPA Alan Page Community Award: Geno Atkins (Cincinnati Bengals), Kelvin Beachum (New York Jets), Von Miller (Denver Broncos), Cam Newton (Carolina Panthers) and Andrew Whitworth (Los Angeles Rams). Previously known as the Byron Whizzer White Award before being re-established this past fall, the Alan Page Community Award is the highest honor that the NFLPA can bestow upon a player. The award annually recognizes one player who goes above and beyond to perform community service in their team cities and hometowns. Each of the finalists will receive an additional $10,000 for his foundation or charity of choice, with the winner being determined through a vote by their NFL peers. The recipient is scheduled to be announced at 3:30 p.m. EST on January 31 at the NFLPA’s annual Super Bowl press conference at the Georgia World Congress Center. There, the honoree will receive a $100,000 donation to his foundation or charity of choice. The nominees for the award were pulled from the NFLPA’s Community MVP campaign, when 18 players were honored every week during the season for their outreach efforts. Each MVP was previously awarded $10,000 for his foundation or charity of choice along with an in-kind donation from Delta Private Jets. Additionally, a limited-edition bobblehead and T-shirt was created of each MVP and made available for purchase by supporting partners Forever Collectibles and Life Is Good, respectively. The NFLPA will donate part of all proceeds from these collector's items to each player's charity or foundation of choice. A panel of judges from across labor, media, sport, service and charity narrowed the pool of 18 candidates down to five finalists. The panel included Charlie Batch (former NFL player and 2013 Whizzer White award winner), Mike Jones(NFL writer for USA Today), Kelly Love (VP of Corporate Strategy and Business Development at Delta Private Jets) and Marc Pollick (president and founder of The Giving Back Fund). During the holiday season, when many are hit the hardest, Atkins stepped up to provide a helping hand. In earning Week 15 Community MVP honors, the Bengals Pro Bowler provided tens of thousands of dollars in resources, financial assistance and events for 50 families in need during his “Atkins Week of Giving.” Gifts included a shopping spree for a family of four, contributing to a family going through the adoption process and purchasing furniture for multiple households. As one of the league’s most charitable players, Beachum continued his advocacy for the fight against food insecurity by spearheading the World Food Day Match Challenge. The Week 6 Community MVP’s campaign generated $71,590 (including Beachum’s own donation of $46,000) for five food banks to combat domestic hunger. As a result of the three-week campaign, 337,892 meals were provided to those in need across the country. This marks the second straight year that Miller has been selected as a finalist – and for good reason. The Week 12 Community MVP, who struggled with near-sightedness as a child, launched his first “Von’s Vision Center” at the Denver Broncos Boys & Girls Club. The kiosk-like center provides underprivileged students with free eye exams, vision screenings and new glasses without having to worry about transportation. In being named Week 11 Community MVP, Newton demonstrated his tremendous heart and reach by serving a meal to more than 1,200 underserved children at his seventh annual “Cam’s Thanksgiving Jam” in the Charlotte area. The Panthers quarterback also provided a second Thanksgiving meal for the attendees to prepare at home. With his city in need following the devastating California mass shooting and wildfires in November, Whitworth answered the call by donating his game check (approximately $60,000) to the Ventura County Community Foundation’s Conejo Valley Victims Fund. The Week 10 Community MVP, who was forced to evacuate his own home due to the wildfires, also auctioned off his game jersey to benefit the American Red Cross Southern California Wildfire Relief. Learn more about the NFLPA Alan Page Community Award.